Comments: The Pinwheel Galaxy (also known as Messier 101 or NGC 5457) is a face-on spiral galaxy about 27 million light-years away in the constellation Ursa Major. 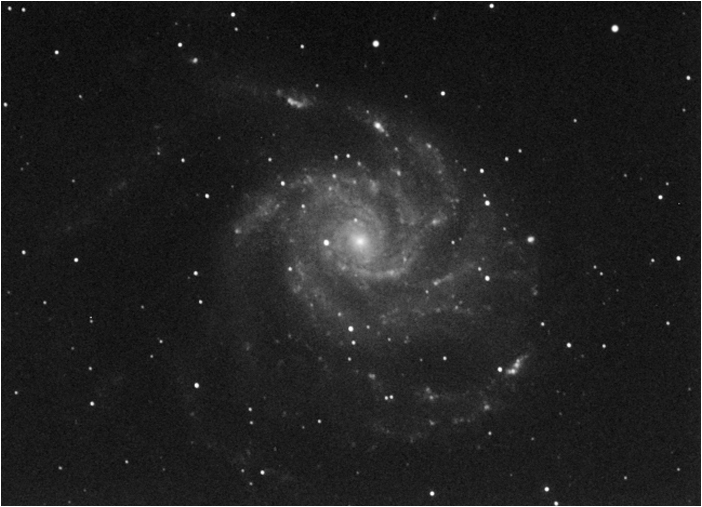 M101 is a relatively large galaxy compared to the Milky Way. With a diameter of 170,000 light-years it is nearly twice the size of the Milky Way. Another remarkable property of this galaxy is its huge and extremely bright H II regions , of which a total of about 3000 can be seen on photographs. HII regions usually accompany the enormous clouds of high density molecular hydrogen gas contracting under their own gravitational force where stars form. HII regions are ionized by large numbers of extremely bright and hot young stars.